A binary image is the type of image where each pixel is black or white. You can also say the pixels as 0 or 1 value. Here 0 represents black and 1 represents a white pixel. I often find peoples calling grayscale image as black and white. 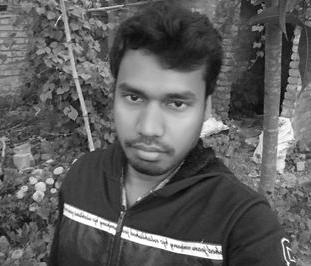 Now let’s understand what is grayscale and what is a black and white or binary image with the example of my own picture. Each of the pixels of the above binary image is either black or white. Or we cay each pixel value is 0 or 1. So you have seen the same image as grayscale and binary and got the idea of a binary image. 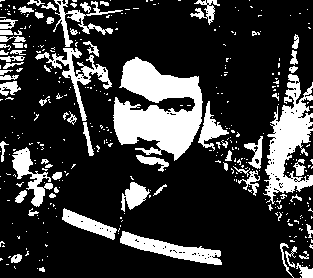 Now I am going to show you how you can convert RGB to Binary Image or convert a colored image to black and white. Here we are just going to write a few lines of Python code and it will convert our RGB image into a binary image. Now we can continue writing Python code. now you can run and test the above code on your system. You have to pass your own image to the imread() method. After you run the code, you will able to see the binary image of the given image which path you have given to the imread() method. what is the mean of line 6…”ret”?? In our code, ret is a boolean regarding whether or not there was a return at all, at the frame is each frame that is returned. If there is no frame available, then you won’t get an error, you will get None instead of the error. So it is preventing your program from getting any error.